How can a garden be taken care of when its owners are away on a summer holiday? Here are a few words on a question which will require further investigation. Three elements made me choose this topic, which I am writing about on the last day of our summer holiday. First, I heard of a balcony left full of flowers in blossom mid-July and found with almost dead plants when the person came back on 28 August. Someone was supposed to take care of them, however it didn’t work according to plan: the flowers were not watered enough. Second, we went for a week around Lake Geneva in Switzerland mid-August, where I looked at a private garden I had discovered in spring 2016 in Vevey, which I mentioned in my 30 April 2016 post ‘Jardins de Suisse’. 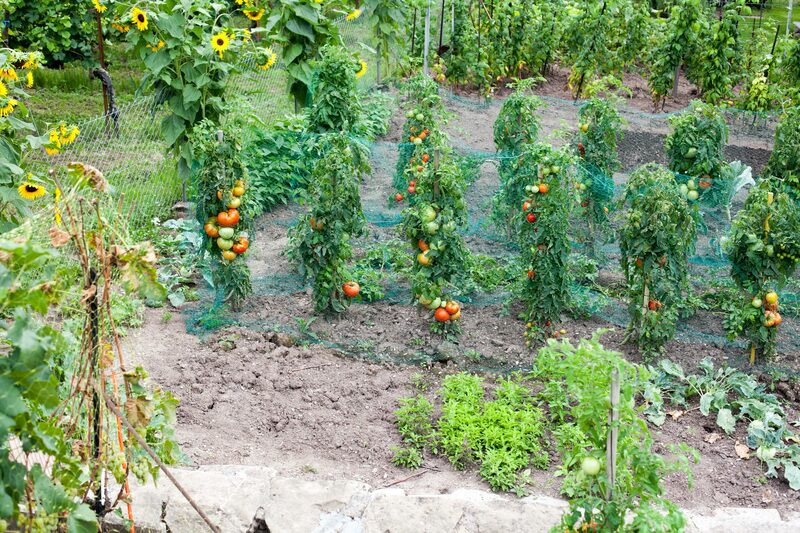 The garden, full of vegetables and fruit, was so tidy that it is difficult to imagine how it could be taken care of by anyone else than its owner. 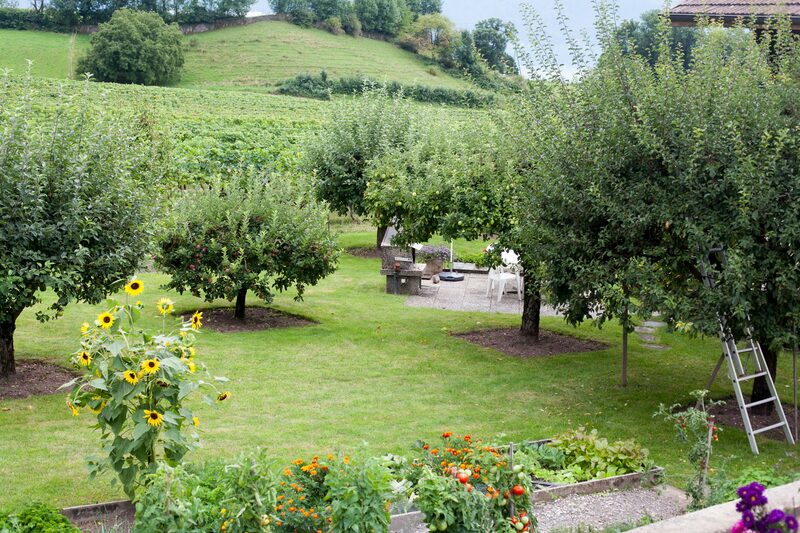 Third, there were those apples trees in this small other garden in Vevey, shaped like the trees we saw from the motorway in the commercial orchards between Geneva and Lausanne, and loaded with as much fruit. The trees looked so strong and healthy that it seems they didn’t need any care at this time of year. Their owners could then leave and go away for a holiday before the harvesting season? The tidy garden. Its owner had just finished harvesting plums from the tree on the right-hand side. The two apples trees in the middle are full of apples (click on photo to zoom in). Photo 15 August, Vevey, Switzerland. Same garden. Zooming in will enable the reader to see how well taken care of the soil is, and how much it produces as a result. Such a garden requires constant care. Another garden I had featured in my 30 April 2016 post. The trees are now loaded with fruit, which is ripening without needing any particular care at this time of year? So, what gardeners who want to go on a summer holiday can do? I already mentioned in previous posts that fruit trees are a good solution for busy people because they require less constant care than vegetables. They can even go on holiday without worrying about their trees, while vegetable growers need to be there or find reliable people to cater for their garden. Planting cultivars that ripen later in the year, rather than in August, is another means for gardeners to go on holidays without worrying. Many apple and pear varieties are harvested in September / October. Otherwise, for gardens where both fruit and vegetable are grown, it helps if gardeners can rely on skilled people to take care of their gardens for a few weeks. This is another reason for developing local communities where people can support each other to maintain productive gardens. This will be further investigated in another post. 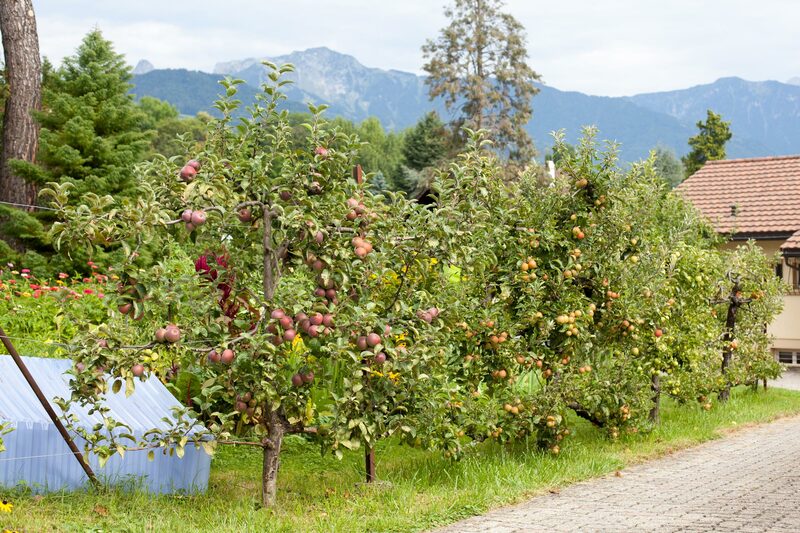 This entry was posted in Grow and tagged Apples, Switzerland, Vevey by Les Jardins d'ici. Bookmark the permalink.